This past week I had my after holiday lesson with Elaine. I had to miss a week or this would have been sooner because I was sick, and I still am a little sick yet; but feeling much better. This lesson was simple. Navigate around the block right out side my home. Oh, and did I mention, while wearing blinder glasses? This way it’s sure that you really CAN NOT SEE ANYTHING! Things get a little more interesting now don’t they? We made one pass up the block with out the glasses so she could see that I was walking in step with the cane. By now and all the practice I have been doing on my own this was no problem at all; she was impressed. After we made it to the top, we crossed the street and then, with the blinding glasses on made our way down the other side. I was a little hesitant to say the least. This side of the street the sidewalks are very bad! Upturned bricks and poorly maintained, make it a challenge even for me and mom in daylight, let alone when you cannot see any thing at all. Sweeping the cane from side to side, I suddenly became more aware of every bump and dip in front of me. The cane was providing the information I wanted. We cleared the bad part of the sidewalk with not too much trouble. As we continue, she informs me in a few more steps we will be at the curb, and to tell her when I think I found it… Sure enough in just a few more steps, I felt the cane dip, and my foot slope down the ramp at the curb. We made a right and walked up one of our side streets, this sidewalk was much better, and again she says tell me when you find the curb… No problem! As we stand at an alley way, she says tell me what you hear; well I did hear a car idling but she says it is parked, but that’s good, it’s what she wanted to know. We continue on our walk, and I’m feeling a bit more comfortable and pick up pace a little bit, still with the blinding glasses on, we make our way around the whole block! Stopping at curbs, listening… As we pass houses and open lots she reminds me to listen for the differences in pitch of how sounds change from an enclosed space to an open space. We finished our walk… I had navigated a whole city block around my house truly blind, using just my cane. We also went over more cane use at curbs, and how to hold the cane across your body to make it more visible to people and cars; also stepping off the curb and continuing the proper arc to again stay in step. I’m progressing well! Lets see what next week brings! First off, let me remind you all again, I am NOT totally blind. I’m “Legally Blind”. I can see objects in my path and for the most part avoid them. I choose to start using the White Cane, to help me get around better in public places; places where other people may not know I have poor eyesight; like crossing a street, reading a menu, or basic crowed control. I feel like Moses parting the Red Sea some times, so the White Cane is useful, it does tend to make people move out of the way (most of the time) that is kind of cool. With a little work, we got this down OK, with only a few mistakes. But you say, why, who cares? Walking in step is important… If I were totally blind I’d want the cane to have swept where my foot is goingto be first. before I step. After this, we did door work… Again a technique… You bump the door with the cane; fine you know it is there, then what? Holding your cane as you normally would (like a golf club grip)… you rotate the wrist up and out to point the thumb down, and walk the cane flat to the door. Doing this allows you to flush the cane across the door to locate handles. We did some other training in a large room, where she places some blinding glasses on me so I could not see any thing… She places some objects in my path, and it was my job to find them with the cane, and avoid them. I must say, it’s NOT easy, and IS scary… Only you and a stick from walking head long into a chare or table. But I managed OK, and the drill was designed to show that you can trust the cane and what it tells you. That’s it, that’s cane use 101… Stay tuned for more, but my next O&M won’t be till January and the new year. Thank you all for your support. Do you know what the White Cane really means, and it’s history? Do you know why the White Cane is, white? You can learn more here. 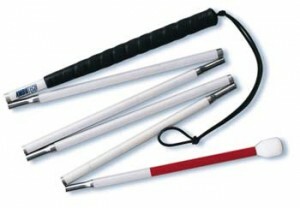 Do you know that October 15th is National White Cane Safety Day?